Coins of the Realm, Inc., was established in 1974 by Peter A. Boyer an avid numismatist. 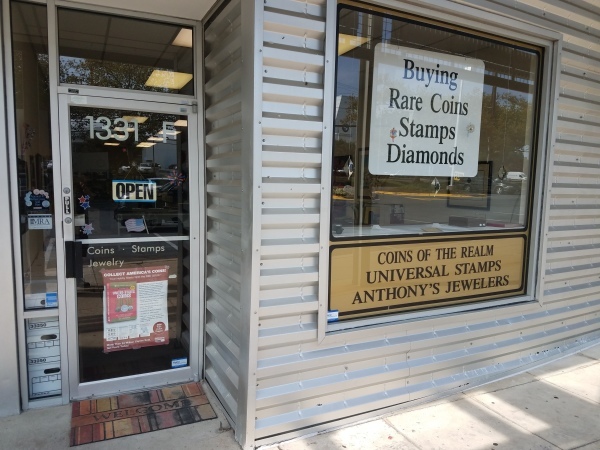 Our stamp division, Universal Stamps, and jewelry division, Anthony's Jewelers were launched a few years later. We have remained at the same location in Rockville, Maryland under the same ownership and management providing professional service to the Washington Metro area. Our goal is to provide consistent, competitive pricing to the public, whether we are buying or selling. We have established a reputation as accurate graders of coins, stamps,paper money, and diamonds. In addition we are authorized PCGS (Professional Coin Grading Service) and NGC (Numismatic Guarantee Corporation) dealers, which enables us to have your coins graded by a reputable third party if warranted. This can be most advantageous in evaluating and selling your holdings. We are also members of a national computer network that allows us live coverage of the volatile coin and precious metal industry. In today's marketplace this information combined with our experience and attendance at national coin and stamp conventions is a must to provide our customers with accurate pricing. Selling your valuables to us is safe and secure with our competitive pricing, experience, free storefront parking, and financial strength.